The final race of the Series and the season as far as Wednesday evenings go contained all the anticipated drama as the series podium went down to the wire. 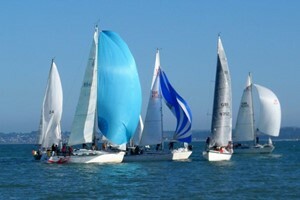 In the very light airs the initial offering from Jolly Jack Tar the SOOD of a reach to Stokes Bay Central and a reach back drew an immediate couple of calls of protest regarding the shortness of the course. It was then amended to twice around. Reaching up and down Stokes Bay however was a little puzzling until the start gun revealed all and JJT broke out her Code Zero sail, the only boat in the fleet that had such a beast in her sail inventory - good thinking team! Alas it was to no avail as carrying Kew Gardens around the racetrack proved too much of a handicap. The real battle for first place in the series was between TinkerT and Sunshine, whichever boat won the race won the series. At the start both yachts opted to white sail rather than try the odd assortment of spinnakers hoisted by others in an attempt to match the code zero of JJT. This paid dividends as the wind came further forward as the first mark was approached and Sunshine rounded with a narrow lead over TT. This they held on the next kite reaching leg back to Darling Associates but opted to drop early on approach to the mark. This allowed TinkerT to creep back into contention as still carrying their kite they closed to within a boat length at the mark. As Darling was also a bit of a tidal gate this was to cost them dearly. Sunshine eventually took line honours but was not far enough ahead to prevent a handicap and series win for Tinker T. Sunshine's consolation prize however was that she took the Series win in NHC. A huge Thank You to the Hornet Services Sailing Club catering team for the provision of liquid and solid refreshment after racing throughout the season. It is very much appreciated by the sailors. Thanks also to the Legion Security team for their welcoming flexibility on a Wednesday evening, it really does make a difference! A date for diaries Wednesday 28 November - RNSA(P) PRIZE GIVING at HSSC. Details to follow idc.